SDFACT’s mission is to advocate for the protection and humane treatment of animals in South Dakota. We support candidates and incumbents who align with these values. We advocate for humane legislation, oppose inhumane legislation, and educate the public on issues that affect animals in our Statehouse. 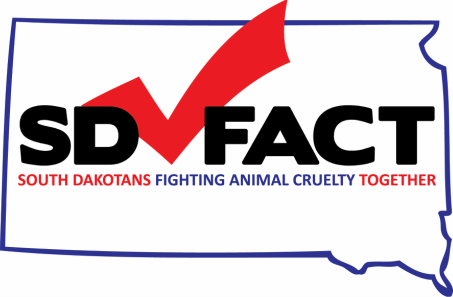 SDFACT is committed to animal protection and working to end animal cruelty and suffering in South Dakota. We are an all-volunteer, nonpartisan, nonprofit organization, incorporated by the state. We operate as the political arm of the animal protection movement in South Dakota. SDFACT supports democrats, republicans, and independents based on their support of animal protection. We organize and mobilize volunteers in regions throughout South Dakota supporting humane-minded candidates. We raise money from compassionate citizens to further our mission at the state level. When lawmakers stand up for animals, we must stand up for them. We want lawmakers in office who develop and maintain laws that protect animals. Contributions to SDFACT do not qualify as charitable contributions for federal tax purposes.